A gaggle of Canada geese surround a woman along the Charles River in Cambridge, Mass. Communities large and small across the nation are dealing with the proliferation of goose waste that litters parks and can contaminate waterways. BOSTON – Canada geese are loud, aggressive and annoying, but worst of all they poop everywhere – a messy problem vexing cities across the country trying to keep their parks clean and safe. 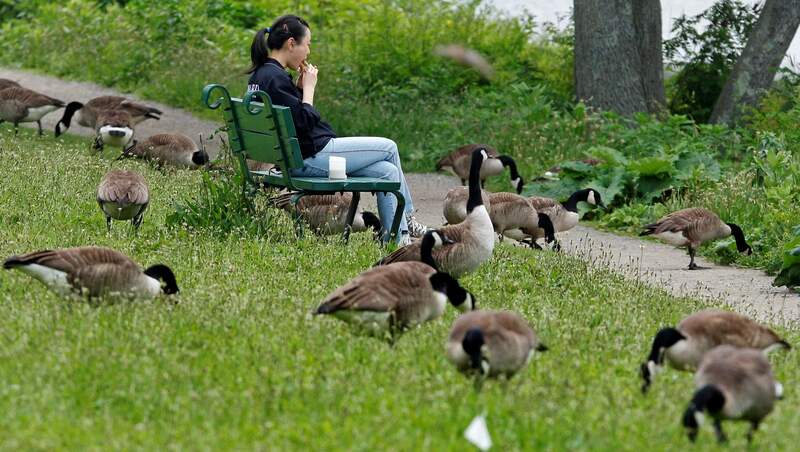 “Geese and their waste ruin youth sports and picnics, make it unpleasant for the elderly who like to walk in the parks and the waste gets all over dogs’ paws,” said Annissa Essaibi George, a Boston city councilor who this week introduced a measure to drive the messy pests from the city’s parks, playgrounds, ballfields, golf courses and waterways. The poop can make humans sick and pollute waterways, said the first-term councilor, a mother of four whose family trips to the park have been ruined by goose poop. Communities large and small across the nation are dealing with the goose problem, said Paul Curtis, an associate professor of wildlife science and management at Cornell University. The National Park Service last year hired a contractor to keep Canada geese off the National Mall. The city of Ithaca, New York, home of Cornell, last year launched a goose control project, he said. Two years ago, after plastic coyotes didn’t do the trick, frustrated officials in Columbus, Ohio, used laser beams and explosives in efforts to keep geese from fouling the banks of the Olentangy River. The geese causing the problems were thought to be near extinction not so long ago, so they were protected, and the population grew virtually unchecked, said Curtis, who specializes in human/animal conflict. “We sort of brought this on ourselves,” he said. They are not the migratory geese seen flying south in a V-formation every fall. The geese that force people to keep their eyes on the ground and dance around little cylinders of poop are called resident geese. They stay year-round, tend to be bigger than migratory geese, live longer and have more young. They eat grass voraciously, and each adult can produce a pound or more of feces per day, Curtis said. They have few predators and are not hunted as much as migratory geese because they tend to gather in urban areas. Andrew Helger, owner of Arlington, Massachusetts-based Southern New England Goose Patrol, is on the front lines of the goose problem. He and his two border collies have been hired by towns, business parks, apartment complexes and golf courses to get rid of geese. The collies, using their herding instincts, scare the birds away but don’t harm them. “I’ve been doing this seven or eight years now, and every year it gets worse,” Helger said. Essaibi George’s measure will be discussed at a future meeting of the City Council’s Committee on Parks and Recreation, where experts and members of the public will get a chance to speak. She said all humane options are on the table. That could include the use of dogs, bright lights and noisemakers, relocation or egg sterilization. The city parks department already uses an egg sterilization program, but it’s apparently not enough.